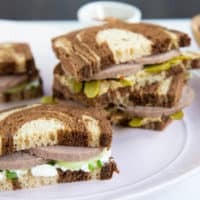 Liverwurst Sandwiches from A Wrinkle In Time | Good. Food. Stories. The first chapter of Madeleine L’Engle’s A Wrinkle in Time (1962) is one of my favorite first chapters of all time. It’s a dark and stormy night when Meg Murray, her little brother Charles Wallace—a prototype, in my opinion, of the child genius character that Orson Scott Card would make famous with Ender Wiggin—and their physicist mother all meet in the kitchen of their large, rambling house, and eat a midnight snack before the mysterious Mrs. Whatsit shows up and turns their lives upside-down. 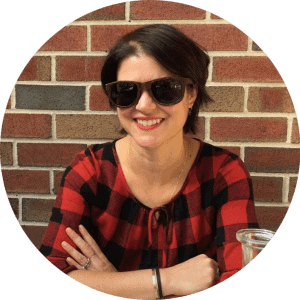 As they eat their snacks and drink cocoa, L’Engle expertly blooms their characters: Meg’s awkwardness and anger, Charles Wallace’s incredible empathy—or is it clairvoyance?—and Mrs. Murray’s strength, intelligence, and tenderness. As a kid, I read this chapter over and over again, wishing I had Meg’s creaky attic bedroom, Charles Wallace’s protective older siblings, and Mrs. Murray’s bright red hair and easy manner. But one thing about the chapter always brought me up short. The midnight snack that Charles Wallace prepares for his mother is a liverwurst and cream cheese sandwich. When I first read A Wrinkle In Time, liverwurst—what it was, why anyone would want to eat it—seemed more puzzling than all the tesseracts, interstellar travel, and mind control by a giant, pulsating brain that was to come. I knew what liver was: my mother used to order liver and onions at the local diner and I’d tasted it (yuck). I knew what chopped liver was: my grandfather didn’t cook at all, except to make chopped liver using a table-clamped meat grinder that was the stuff of horror movies I hadn’t seen yet. It was delicious, but I was too young to know what I was eating. But what the heck was liverwurst? Maybe I asked my parents and simply forgot the answer, or maybe I put the question in my pocket, a tiny stone of mystery I rather enjoyed preserving. Recently, though, I re-read A Wrinkle In Time (which 1000% stands up to re-reading). I turned the first page, now delighted most by the seamless way L’Engle stitches character development to simple descriptions; backstory to character development. 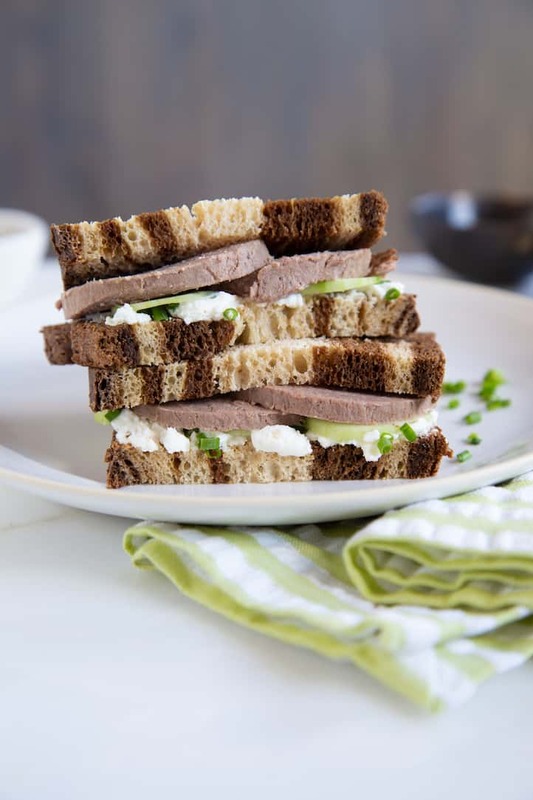 This time, when I got to the liverwurst and cream cheese sandwich, it seemed like the perfect choice to indicate that Mrs. Murray is sensible, unpretentious, and doesn’t have expensive tastes. I also realized that I’d still never tasted liverwurst myself, and that I wasn’t totally clear on what it was. 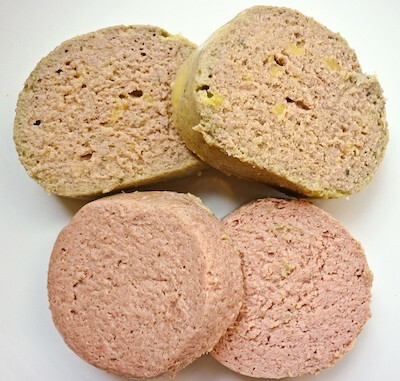 Liverwurst (or leberwurst) is a liver sausage. Long popular in Europe, German immigrants popularized the dish in America in the mid-19th century. It is usually made of calves’ livers mixed with spices and is firmer than pâté but softer than a sausage. When I decided I was going to look into it, I found that liverwurst has fallen so far out of favor that I couldn’t find it in any regular grocery store. Oscar Mayer stopped making it—much to the horror of many People On The Internet—and folks at meat counters across Philadelphia looked vaguely embarrassed for me when I asked if they carried it. I finally sourced some from Brauhaus Schmitz, a German restaurant and beer hall on South Street. The chef gave me two kinds: a classic calves’ liver liverwurst and one that she called a foie gras liverwurst. I got them home, desperately wishing it were a dark and stormy night, as it is for the Murrays, instead of a 97-degree scorcher that threatened to melt my wurst, and tried liverwurst for the first time. The calves’ liver variety tasted like chopped liver, but less creamy. It wasn’t bad, though it’s not something I’d eat every day. The foie gras liverwurst was much creamier and had a sharper taste, as if it’d been mixed with shallots. I decided to use the classic liverwurst for Mrs. Murray’s sandwich, since it’s probably the closest to what she would have had. 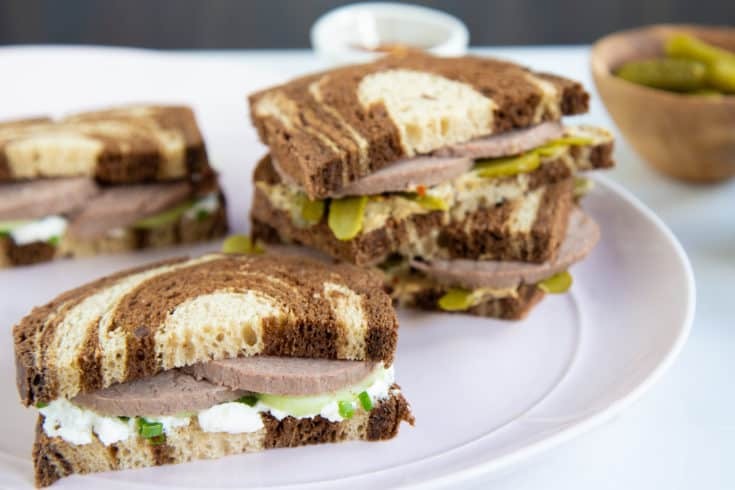 I used rye bread, cream cheese, chives, cucumber, and the liverwurst. 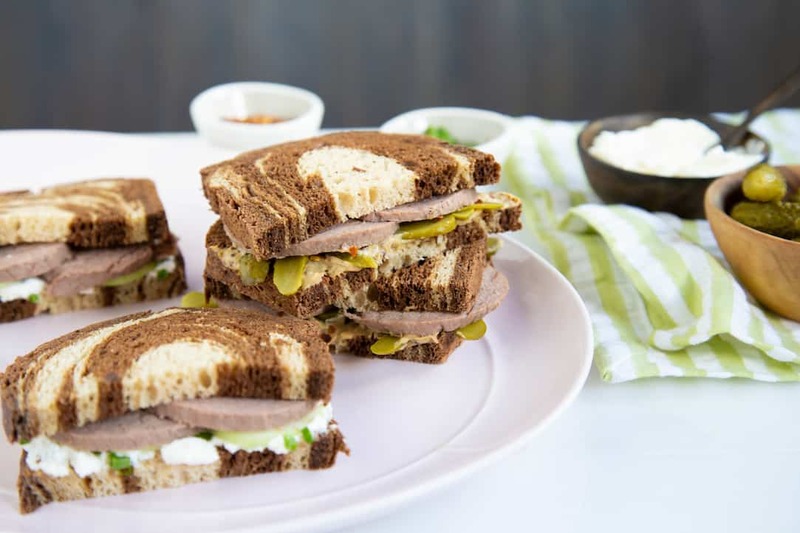 The anise note of the caraway seeds in the bread gave a nice brightness to the liverwurst and the cucumbers made it summery. Then, because the flavor of the foie gras liverwurst was stronger, I paired it with Dijon mustard, red chili flakes, and sliced pickles. I used bread and butter pickles, wanting to give the sandwich some sweetness, but if I made it again, I’d use cornichons instead. The classic children's book A Wrinkle In Time begins with a mention of liverwurst sandwiches. Here's how to make two simple versions. Spread cream cheese over one piece of bread. Sprinkle chives over the cream cheese, then layer with cucumber slices. 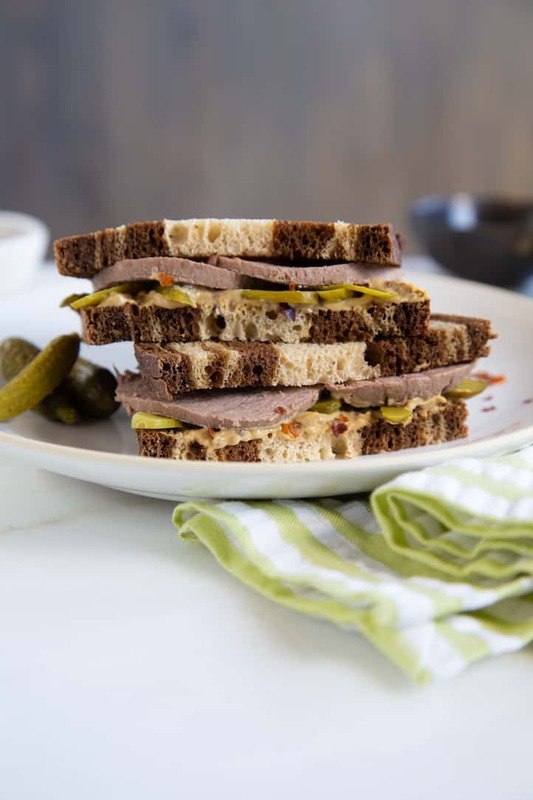 Layer liverwurst slices on the remaining piece of bread, close up the sandwich, and serve. Spread Dijon mustard on one piece of bread and sprinkle lightly with red chili flakes. Layer sliced cornichons over the mustard-covered bread.